I was approached by Ashla Ward a while ago with the view to having a Tunisian Crochet Workshop Weekend in May. Ashla runs a Knit and Crochet group in NUI Galway and booked me for the workshop. I’m delighted and really look forward to immersing myself in Tunisian Crochet and not least the wilds of Co Mayo for a weekend in May. Ashla contacted me the other day and told me that there are still a few places left for the course, so if you are interested all the details for content and booking can be found below! Accommodation and all meals (2 dinners, 2 lunches and 2 breakfasts) plus two full days of classes with Irene Lundgaard for €190. Overlooking Clew bay the EOM house and studio is set in beautiful Mulranny with a blue flag beach nearby. The owner Cheryl Cobern Browne is passionate about craft and the environment and is a welcoming host. All the meals are provided during the stay and Cheryl cooks healthy and delicious foods. The house is modern and spacious with 10 bedrooms including 3 en-suites and some shared bathrooms. The class will take place in the round tower studio that Cheryl has built on the grounds to facilitate crafting groups. The studio will be for the use of group and is left open throughout the stay. ‘Making available the things I am most passionate about is not only a privilege, but deeply enriching for me too – every time.’ Taken from her website http://www.greenwaygetaways.ie/. Tunisian crochet is a cross between knitting and crochet. The distinctive fabric created by this technique looks woven and has very many uses particularly in soft furnishing, bags and not least jackets as well as the traditional use of blankets. Tunisian crochet is typically worked on a long hook with a stopper on the end – similar to a knitting needle. 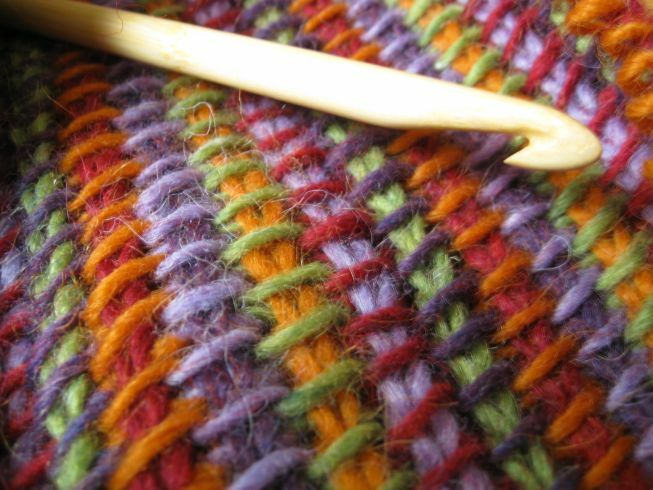 The techniques taught will be classical Tunisian Crochet and there will be an emphasis on colour work (including intarsia) and texture as well as an element of design. Day 2 Working circular including designing your own hat or bag. Double ended Tunisian Crochet Hook size 5 or 6 mm and Aran weight yarn in different colours. A limited number of hooks will be available for sale at the workshop.